It’s that time of year (already!) for the return of those pesky mosquitoes. I’m a born and raised Texas gal and after 30+ years I still can’t stand the little pests. Just when you’re ready to spend all day outside watching the kids play/basking in the sun/eating BBQ, that’s when they make their vicious attack. Those things drive me nuts! It wasn’t until I came across a recipe in First for Women‘s magazine that I even thought about making my own bug spray. If you’ve been following me for a while, you know I like to ‘make it myself’ to A) save money, B) get rid of chemicals and C) because it’s just fun to do. I know not everyone will make their own toothpaste, almond milk, nut butters or homemade broth, but when you think about all the chemicals (DEET) in bug spray…you might reconsider, especially if you are into Essential Oils (EOs). See homemade teething oil here and why I’m not big on MLM companies. This recipe is super easy and perfect for when you go camping. We make a yearly trip with our good friends to Beaver’s Bend in Oklahoma and have been going to Fentress with my family for the past several years, so this is a must have! 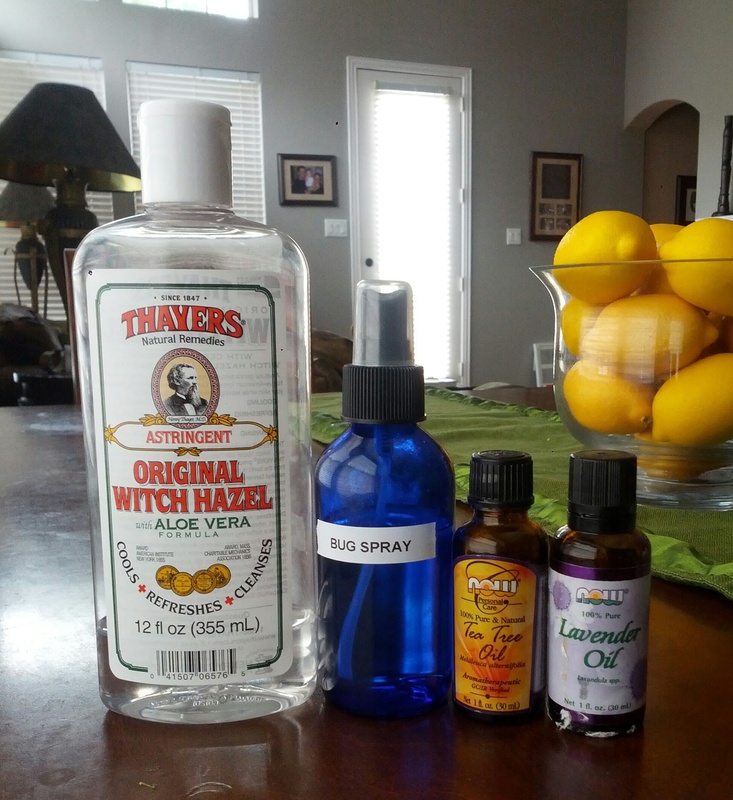 The only thing you will need to gather, that you might not have on hand, is a glass spray bottle and some witch hazel. I picked both up from Natural Grocer’s in their supplement section by the EOs. They must know that people who use EOs like to make their own rubs, roll-ons, and sprays because those containers are always in stock. I had the witch hazel left over after I had Sophia since it helps with hemorrhoids. I’m excited to have found Plant Therapy Essential Oils, that can simply be ordered on Amazon, thanks to Kelly from Primally Inspired for all my EO needs. They are one of the better companies so I feel good suggesting them to you (and have included the links in the recipe). 1. Combine witch hazel with 20 drops of lavender oil, 20 drops of tea tree oil, and 20 drops of eucalyptus oil (or any combination you like) in a glass jar/measuring cup. *I left out eucalyptus due to have little ones…and it still works great! Can I ask why you would leave the eucalyptus out if you have little ones? It’s hard to tell if littles will have breathing difficulty when exposed to eucalyptus (under 10) and peppermint (under 6). These is much debate on the exact age, but I have learned through my holistic group to be VERY careful with them. I hope to post my ‘thieves’ brand oil without eucalyptus very soon. How long will this last on the shelf? Not totally sure, but I still have mine from last year and it works great! Okay, Thanks! I am little by little transitioning my family over to natural and organic products as I can so I am really interested in trying this! I think you will love it! Plus, I feel safe spraying it around the girls should they inhale some of it. Eucalyptus is very potent even with other oils and can cause a burning sensation specially around the eyes. Everything in moderation and again you never know about allergic reactions with little ones. That’s why I left it out and said to leave it out for littles. Does it have to be a glass spray bottle? Or will plastic be ok? 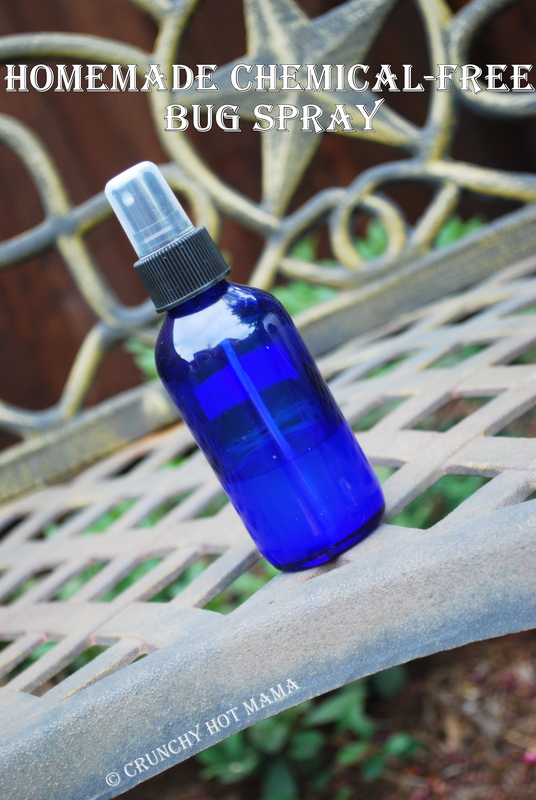 Why a glass spray bottle? I have only seen plastics lately. I just prefer glass. I’m sure plastic would work. I was just wondering, is this concoction to be applied to your skin/clothes or to spray around you? I saw a post yesterday for making a solution to repel ticks. Can these be mixed together or must these be applied separately? I apply it to my skin and clothes.